Hallo und ein schönes Wochenende ihr Lieben! Ich hoffe, ihr seid gut durch die Woche gekommen? Einfach verrückt wie sommerlich es jetzt auf einmal ist! Samira und ich waren vergangene Woche auf den Press Days in Berlin und haben dabei diesen Look hier geshootet. Die Hose habe ich seitdem ich letzten Sommer auf den Philippinen war. Wie ihr vielleicht in den vergangenen Posts schon mitbekommen habt, bin ich ein großer Fan von locker geschnitten Sommerhosen geworden 😉 bald wird es aber auch mal wieder Zeit für Röcke und Kleider. 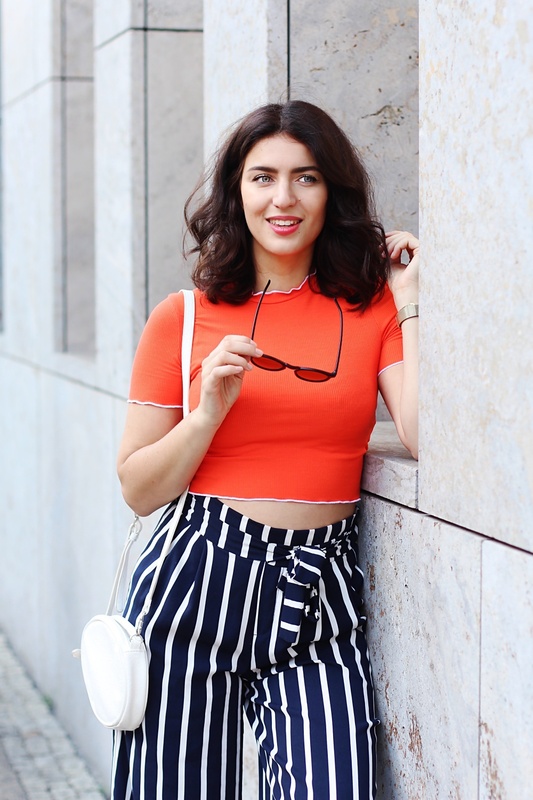 Hier habe ich die gestreifte Hose mit einem knalligen orangen Croptop kombiniert. Ich habe auch orange gerade recht neu für mich entdeckt. Wie gefällt euch der Look? Habt ein schönes Wochenende! Hey guys, how are you doing? I hope you all had a great week! Crazy how summer like it has been in Berlin lately…Samira and I went to the German Press Days last week and took these photos there. I wanted to style these striped culottes that I have since I have been on the Philippines last summer. I almost never find inspirational looks for these kind of pants with flat shoes. Sure everything looks more flattering with heels, but since I am quite tall I thought I would give it a go and style them with platform sneakers. For a casual daytime look I definitely like this look. The orange crop top adds some pop of color. How do you like this look? Have a beautiful weekend! I love this outfit. It’s gorgeous and trendy and you make it chic! Those culottes are fabulous and I love the stripes!